Wedding anniversaries are milestones that should be celebrated. Even if it’s five years, 25 years, or 50 years, being in a marriage for both husband and wife is no easy task. Couples face trials on an everyday basis—and each time an obstacle is overcome and the longer the couple stays together, a celebration should be called for. You may also see invitation designs. When a wedding anniversary is being celebrated, the first things that should be prepared for these events are invitations. 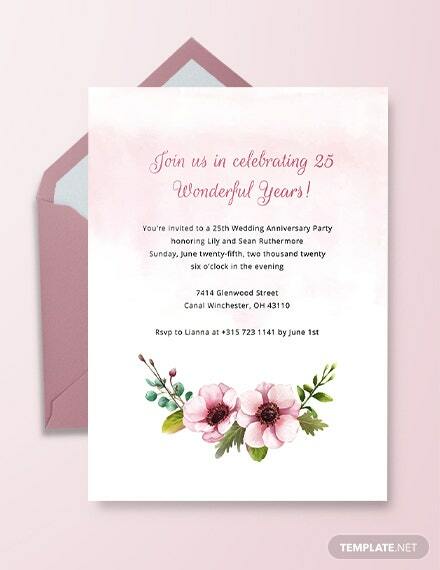 Here are some elegant wedding anniversary invitation designs to use if you are planning your own wedding anniversary soon or if you have been tasked by a couple to do the necessary preparations for their anniversary. This beautifully designed chalkboard wedding anniversary template is highly recommended for any anniversary, whether it is a formal or casual event. Pink and blue colors dominate this chalkboard template which is accompanied by flower designs in the borders. Chalkboard designs have been highly popular the past few years. They have been used for different events like birthday celebrations, weddings, and even business seminars and conferences. Chalkboard designs are very popular as they offer a unique and brand new option in design-making. 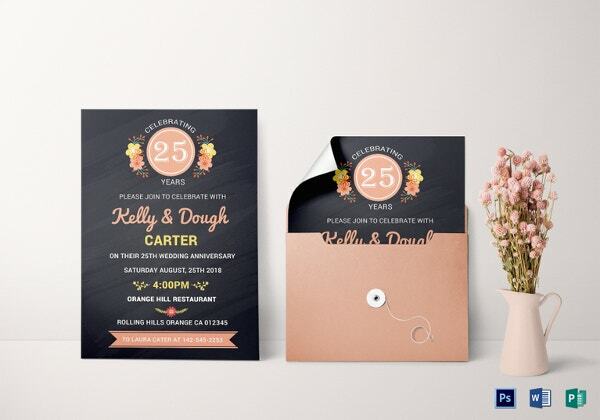 Most likely you or a friend have already received an invitation, flyer, or business card using a chalkboard template. Here is another chalkboard wedding anniversary template. This template has a similar design to the anniversary template above, but this one uses pink hues. The pink chalk colored text matches well with the chalkboard background. Flower images surround the circle logo with the number “25” written on it, signifying the couple’s 25th wedding anniversary. 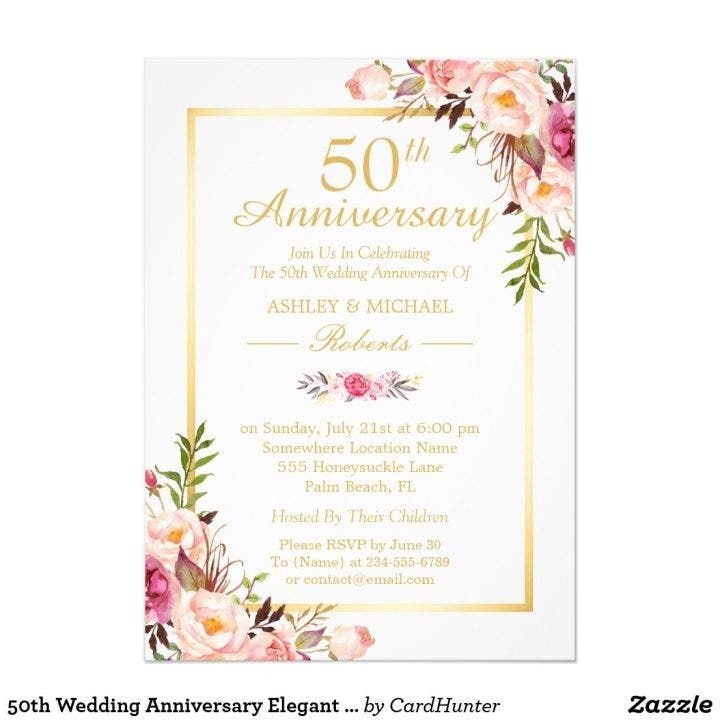 This elegant gold wedding anniversary invitation template is one of the most beautiful wedding anniversary templates around. Gold is always one of the best colors to use for any design, as it represents class and elegance. 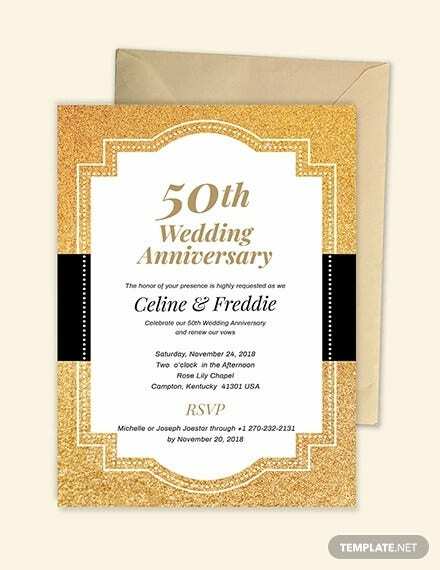 Additionally, gold matches with any color and font style, making it the perfect color to use for design, whether it is for invitations, posters, business cards, or even flyers. This golden invitation template lets you add the text in the center while curved gold metallic bars are embedded in the borders of the invitation. 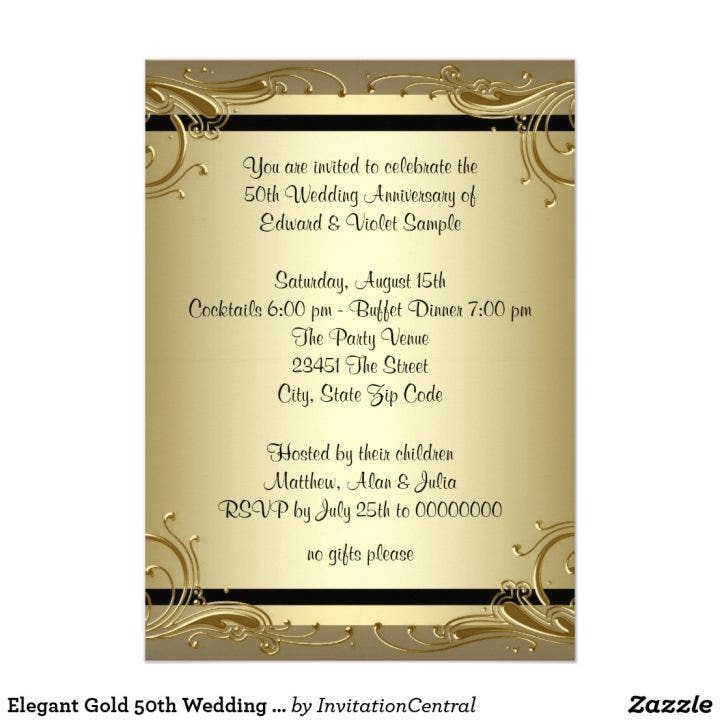 Here is another gold-colored wedding anniversary invitation template. But instead of metallic golden bars, golden glitter is now used as well as images of golden glasses of champagne. 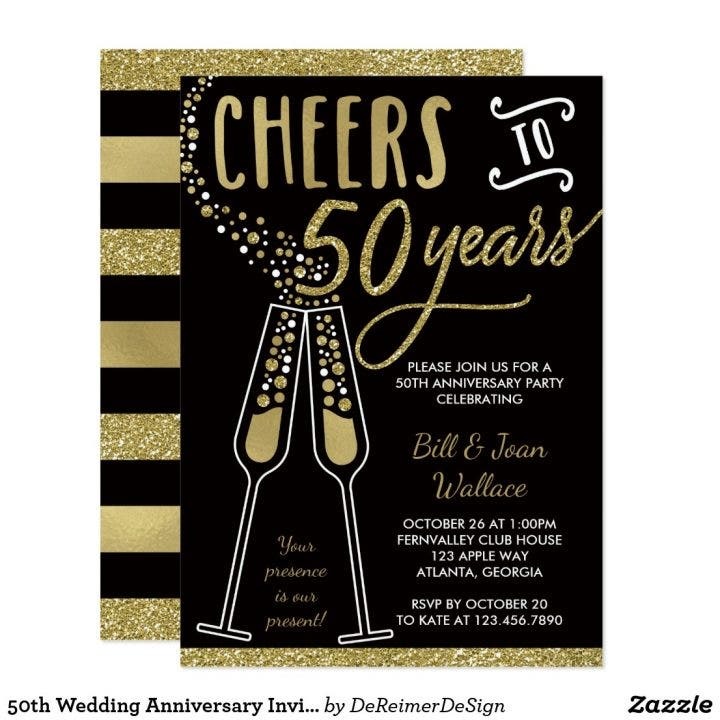 As observed in most 50th wedding anniversaries, gold is the color mostly used as the central color for these events. The golden glasses of champagne add to the aesthetic of this beautiful template. The golden glitter, despite being incorporated in the borders of the template, still grab attention and together with the golden champagne, form a striking combination which will leave the invitation recipients in awe. Here is another beautiful wedding anniversary invitation template using a bouquet of roses as the central design. The roses are situated in the upper right corner and lower left corner of the template. A variation of pink and purple roses are used with leaves also being added to complement the roses. 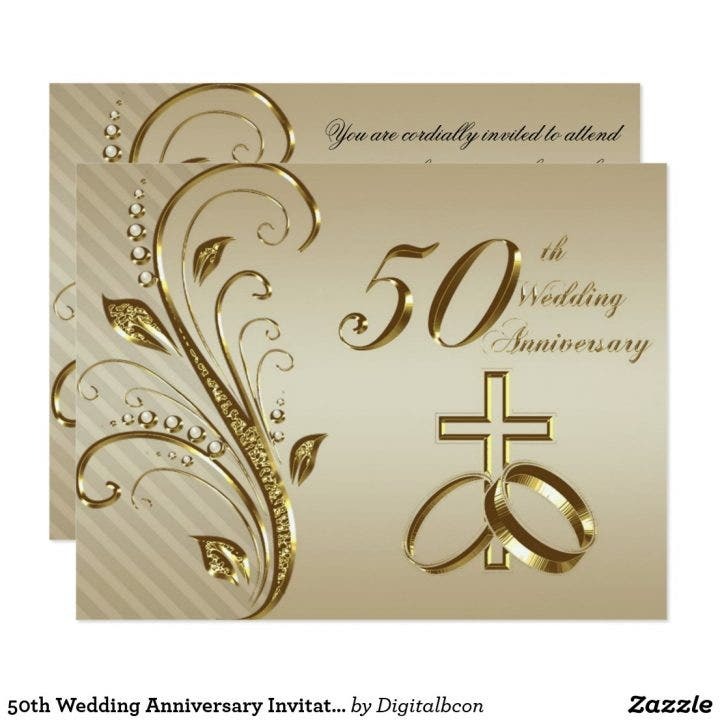 Here is another golden metallic wedding anniversary invitation template. The text is embossed in gold with numerous embossed gold colored images being added to the design. An image of a curved design resembling a stem with leaves is incorporated as the main design. Two golden rings and a cross are also used, representing the couple’s union in a Christian setting. Most of the time, the best design elements for wedding anniversary invitation templates are the photos of the married couple. This template uses two couple photos, one from the couple when they were first married and the other is the current photo of the couple. Edit this template for your own wedding anniversary invitation by also using two photos. 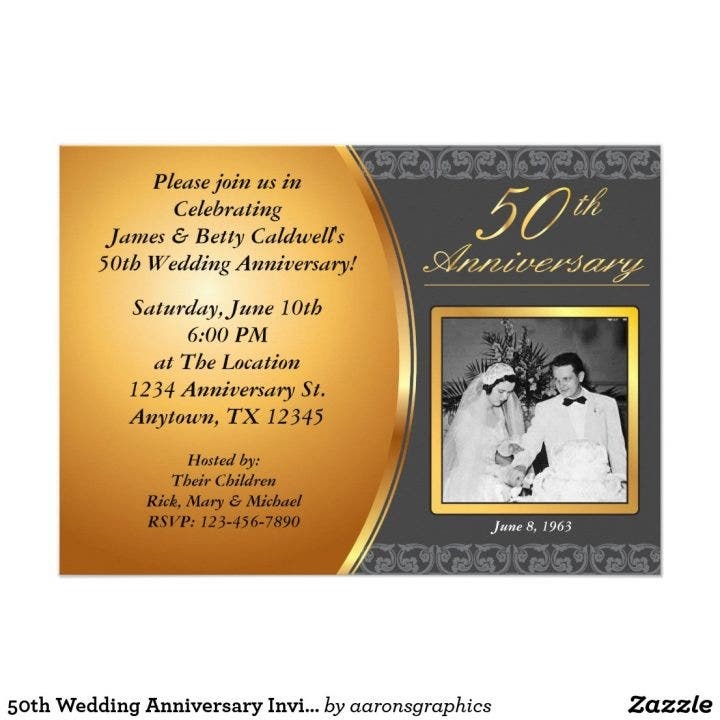 Although this template is best used for 50th wedding anniversaries to create a better contrast in the couples’ photos, you can also use this for young couples celebrating their 5th or 10th wedding anniversaries. Here is another wedding anniversary invitation template, but instead of using two photos, only one photo can be incorporated. The sample image above uses an old wedding day photo of the couple. Edit this for your own template and have the freedom to choose your own photos. Although only one photo can be used, a suggestion would be to have a collage of the couple’s photos. A combination of old and new photos would be ideal. Gradients always add some nice effects to any design as can be seen in this golden gradient wedding anniversary invitation template. The golden gradient background is used to make way for the text. 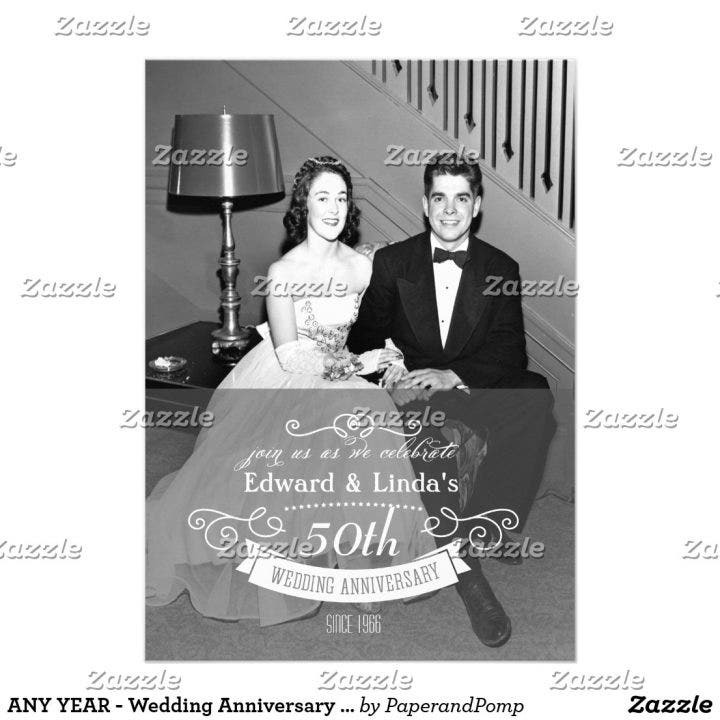 A photo of the couple and the “50th Anniversary” heading is also incorporated in the template. 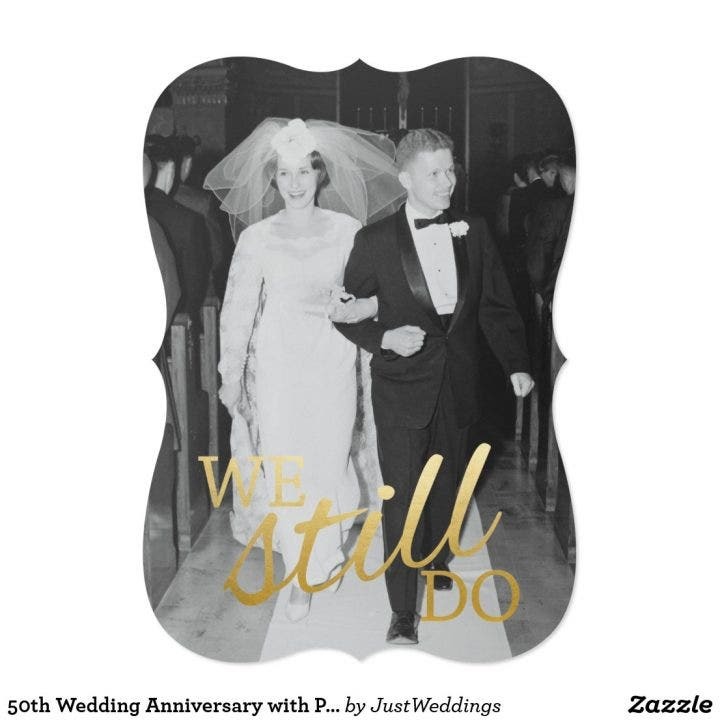 This wedding anniversary template is best used for 50th wedding anniversaries as the “We Still Do” heading perfectly matches the event. The couple’s photo complements the heading which also uses gold colors. If you are planning to mostly use text in your wedding anniversary invitation design, make the text significant to the couple’s story as seen here in this template. 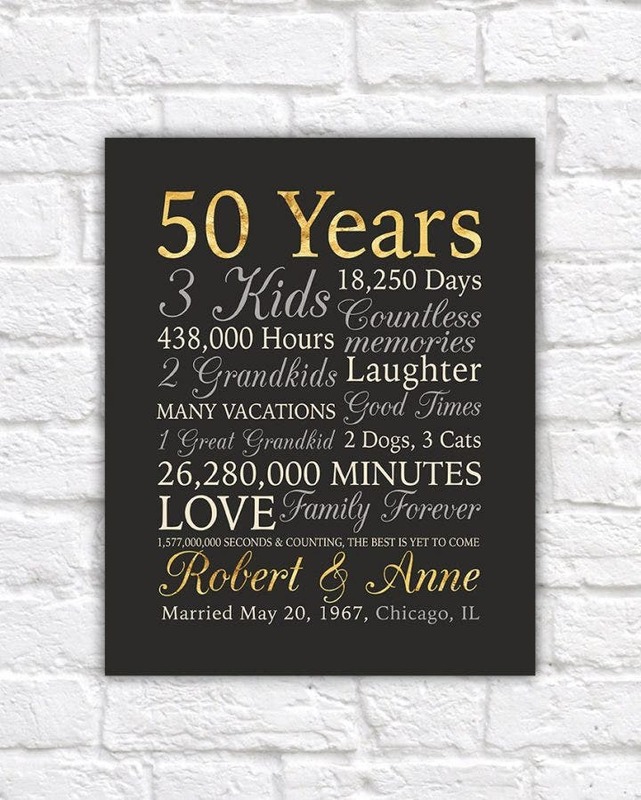 The template shows the couple’s important milestones and moments such as the number of kids, grand kids, and pets they have; the hours, minutes, and seconds they have been together; and other numerous moments. If you manage to remember tiny details such as the ones above, then use this template. 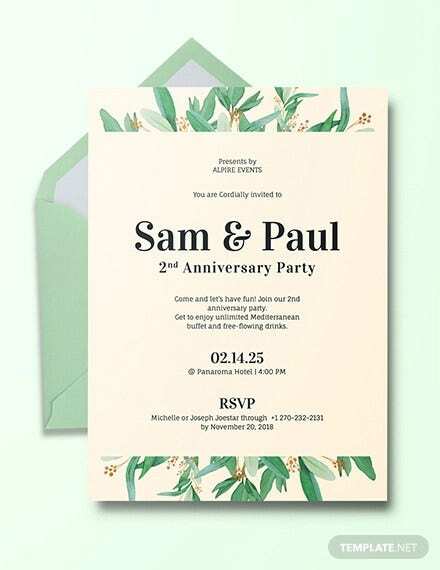 This wedding anniversary invitation template uses a beautiful tree design. A silhouette of the trunk and branches are laid in the background while the leaves are added as a separate layer. Two wooden heart designs and a ribbon are also added for visual appeal. Trees are perfect wedding symbols as they represent strength, good health, and prosperity. 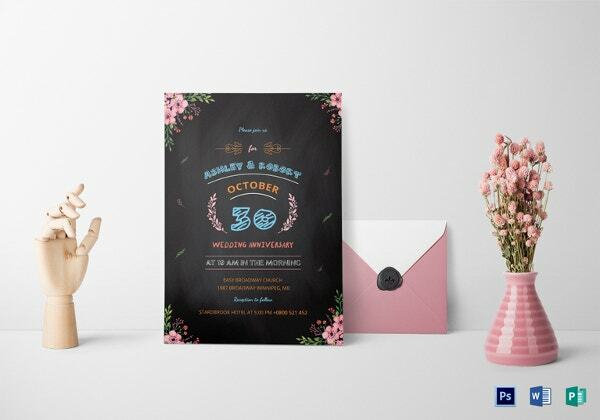 This simple wedding anniversary invitation template is best used for casual weddings, although they can also be used for formal weddings. 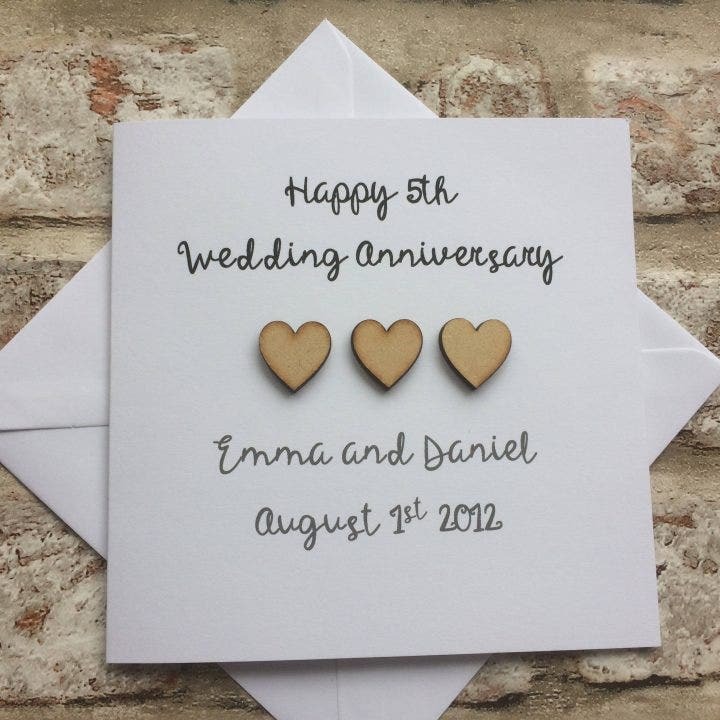 The calligraphy used for the text and the wooden hearts are similar to the ones found in the previous template and these comprise the designs for this wedding anniversary invitation template. 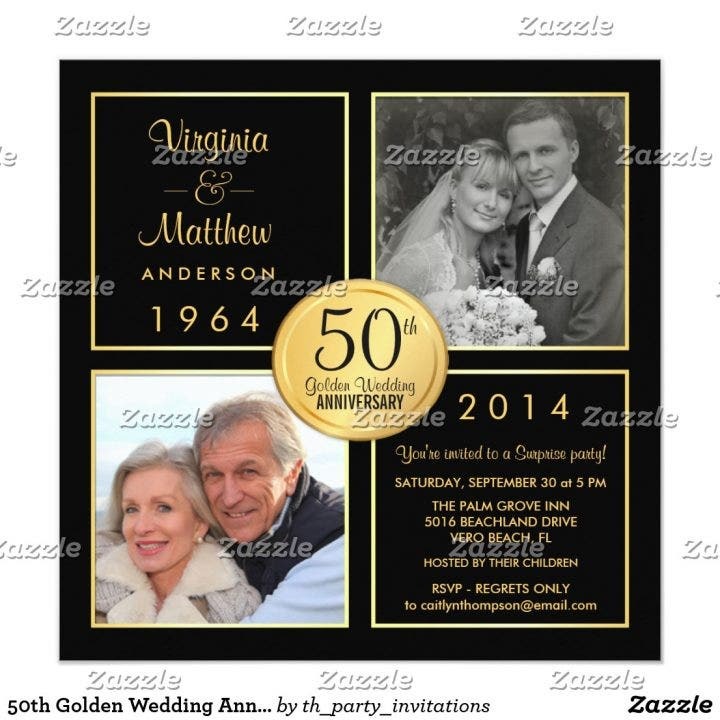 If gold represents 50th wedding anniversaries, silver represents 25th wedding anniversaries. 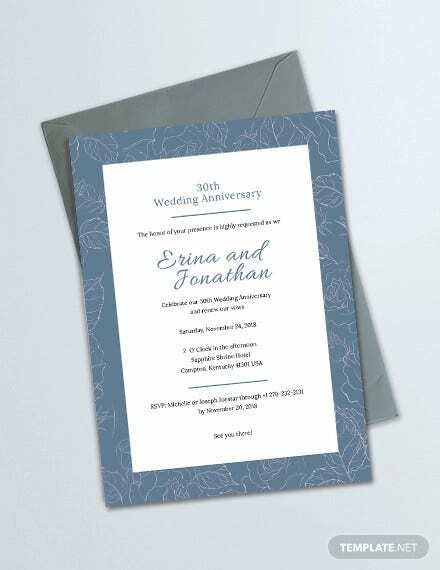 This beautiful blue-and-silver wedding anniversary invitation template uses some nice sparkling silver designs that complement the blue background. We hope you enjoyed browsing through our 15 elegant wedding anniversary invitation templates. There is a template perfect for each wedding anniversary event, so feel free to choose one for your purchase. They are the most affordable yet beautiful templates around the web.